Mississippi Court of Appeals Chief Judge L. Joseph Lee was recognized Thursday, Nov. 15, for more than seven years of exemplary leadership of the court and 20 years of public service. 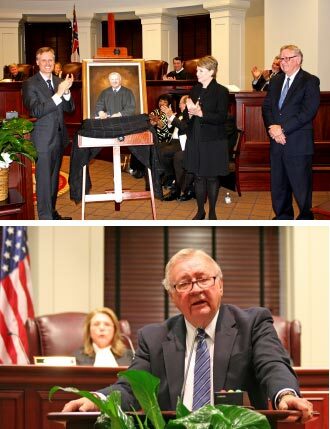 Chief Judge Lee presented his portrait to the court during a retirement ceremony in the courtroom in Jackson. He will retired Dec. 31. Speaking to a crowd that packed the Court of Appeals courtroom and required overflow seating outside, Bennett said Judge Lee personifies professionalism. She thanked him for giving generously of his time and resources in support of legal education. He mentors and encourages law students and lawyers. Days before the ceremony, Rosenblatt queried Judge Lee’s colleagues, law clerks, judicial assistants and former staff. They described him as a man of integrity and honor whose patience and respect for others set him apart. He is hard working, fair and impartial. No detail escapes his attention. He writes opinions that are clear and concise, and are supported by common sense. He is a consensus builder who shows great respect for the court and its judges. He is a man of great faith who is compassionate and considerate. He is also known his good sense of humor, for feeding court staff and colleagues with tomato sandwiches in the summer, and for his collection of antique cars. The reception served mini tomato sandwiches. Judge Donna Barnes noted that none of the judges have served on the court without Judge Lee. “While the institution of the Court of Appeals will continue...the court as we know it will be forever changed,” she said. She presented him with a group portrait of the court.